I took this shot at the only time I managed to drag myself out at dawn during my trip to Italy. After snoozing for half an hour I was running out of the pre-dawn light. I shoved some clothes on and some cereal in my sports beaker for breakfast on the road. Unsure of exactly where to go and not helped by the malfunctioning satnav app on my phone, I jumped in the car and headed for higher ground. Panicking, I raced along the winding Tuscany lanes and took risks cutting corners, one eye on the road, the other 360° around for potential views. All the while shaking off the dream state I was still half in. I desperately needed food and coffee. There was no time, the pink in the sky would fade in minutes and the great ball of nuclear energy would light up the world. 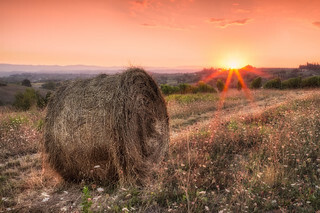 I almost skidded to a stop when I saw the bale of hay, behind it the first fingers of light reaching up from the horizon. It was now or never. If I drove any further to look for something better the colour in the sky would disappear and I should have stayed in bed. A brief check list in my mind; camera, lens, tripod, base plate, lens blower and cloth… and something else! Hurry… think… oh yeah, remote release. Wake up! Forgetting that now could cost me a few vital minutes. I extended the tripod legs as I strode to the spot just in time to set it as I arrived. A quick three shot burst to check exposure. A rapid adjustment then immediately another burst which became this HDR shot. Five minutes later the sun revealed its full glory and threw out its usual colourless rays, quickly turning the sky pale blue. The lesson; make hay before the sun shines.